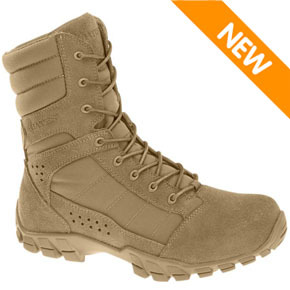 With the U.S. military transitioning to the ACU OCP uniform, Bates introduces the E08670 Men's Hot Weather Coyote Brown ACU OCP Military Boot. This boot is AR-670-1 approved for official military uniform wear and meets the stringent requirements of the U.S. military. This coyote brown boot features Bates' anti-fatigue Endurance Performance System, delivering the comfort that you want with the durability that you need. The Bates E08670 Cobra provides the ultimate in durability with 100% certified cattle hide leather and abrasion-resistant nylon fabric. Perforated leather venting promotes excellent air flow to keep you feeling cool even in the extremely hot temperatures encountered in the Middle East. A multi-terrain, slip-resistant rubber outsole provides excellent grip on both smooth and loose surfaces.